It’s that time of year again! The holiday season is upon us and there’s few whiskeys that hit the spot quite like Wild Turkey rye. More specifically, few whiskeys that hit the spot quite like Wild Turkey 101 Rye (especially for the price). It’s no secret. Wild Turkey 101 Rye is my go-to Christmas whiskey. Whether it’s decorating the tree, cooking up some goodies in the kitchen, or sitting back watching a virtual Yule Log, Wild Turkey 101 Rye has that special holiday something. How so? Well, I think it’s primarily because it doesn’t compete with the multitude of holiday scents and flavors. From fresh-cut fir trees to fresh-baked treats, 101 Rye has the perfect dose of flavor to cut through the mix, yet simultaneously blend in and “mingle” without causing sensory overload. Sure there’s other holiday whiskeys folks reach for, but I’d argue that none are as versatile for the money as 101 Rye. While it would be easy for me to compare Wild Turkey 101 Rye against expressions from other brands, I’ll refrain from that in today’s post. You like what you like, but my guess is that if you’ve read this far, you’re either well-situated in the Wild Turkey camp or you’re already headed this direction. Either way, just know that there’s plenty of whiskeys that are loved as much or more than 101 Rye. Why is that? Well, I’d say it’s half personal preference and half inexperience. As for personal preference, there’s just some folks that don’t like rye whiskey. Hell, Jimmy Russell isn’t the biggest fan himself, so rye naysayers are in expert company. As for inexperience, it’s largely due to the fact that Wild Turkey 101 Rye isn’t the easiest bottle to find. When it is found, it’s almost exclusively available as liters. This goes back to its temporary near discontinuation in the early 2010’s as a result of low stocks. The only bottles that were filled at that time (post 2011) were liters, as they were ideal for bars and restaurants. Fortunately, over the last few years rye production has increased significantly. There’s more Wild Turkey rye out there than ever before, yet still not enough to satisfy the masses. It’s a short-term problem with a long-term solution: make more whiskey. And according to the Russells that’s exactly what’s being done. I suppose it’s only a matter of time before we see an increase in nationwide distribution for 101 Rye. Speaking of increased production, I thought it might be a good time to inquire on the makeup of this year’s 101 Rye. Knowing that recent rye releases were likely produced at the new Wild Turkey distillery (2011), I reached out to Brand Ambassador Bruce Russell to find out if 2018 batches might finally be 100% new distillery whiskey. According to Bruce, it’s still very possible that old distillery whiskey is included in 2018’s 101 Rye. Certainly not a bad thing in terms of value, as that would mean whiskey older than six years helped to shape the flavor profile of this year’s expression. 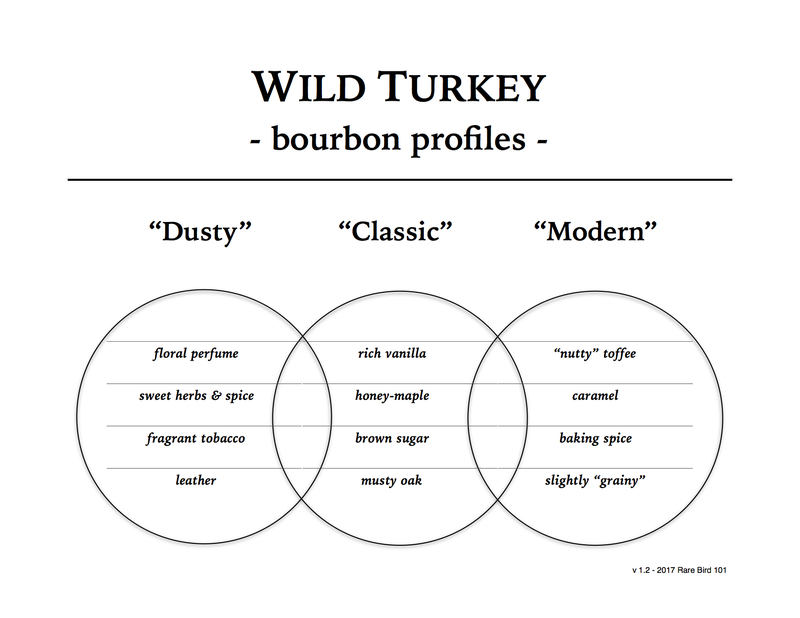 So the question now is, how does a current bottle of Wild Turkey 101 Rye perform? I must say, I was quite impressed with 2017’s release. Will 2018’s sip better or worse? Well there’s only one way to find out. Let’s pour! Overall: This is damn good rye whiskey. It’s not amazingly complex or thought provoking, however. No, bold simplicity has always been Wild Turkey 101 Rye’s strength. In fact, I can’t think of a single Kentucky straight rye whiskey at this price tier that’s equally as balanced and rewarding at over 100 proof. At least I’m fairly certain the list of competitors is sparse. As for how this 2018 Wild Turkey 101 Rye compares to 2017’s release, that took a little time to garner an accurate (yet still inevitably subjective) answer. When I first opened this 2018 bottle (interestingly filled on Valentine’s Day), I haphazardly concluded it was better than the 2017 bottle I’d been sipping. But I’ve done this long enough to know that initial impressions are often deceiving. To be completely thorough a side-by-side comparison is warranted (so that’s exactly what I did). After considerable back and forth between the 2017 and 2018 101 Rye, I determined that neither release is particularly better than the other. Slightly different, yes. Firmly better, no. If I had to sum it up I’d say that the 2017 Wild Turkey 101 Rye is a little sweeter, with a touch less rye spice. The 2018, on the other hand, is more spice-forward with a pinch of additional oak char. Both are quality pours, yet each shine in their own subtle way. If I had to choose between the two, I’d probably take the 2018 (being a fan of oak and spice). But honestly, I’d happily sip either. At the end of the day, Wild Turkey 101 Rye is a delicious and well-balanced whiskey that makes my virtual Yule Log seem warmer and brighter with very little effort. It’s no Christmas miracle, but it’s damn near as satisfying. Cheers and Happy Holidays! Great critique! I just picked up a second bottle since September: it pops up from time to time here and I either get lucky or it’s not popular. The last bottle had the nicest black liquorice taste and curiously a really long finish. My only slight complaint was after a month or so it changed in a way I didn’t care for: those two qualities seemed to diminish, Still, I drank it daily so it didn’t last long: most of the time it was great! Love the stuff! Luckily I can find it pretty easily around here. And you’re right, something about it just screams “Christmas drink”. I have a bottle from 2017, and the first 2 pours were distinctive, but nothing suprising. Letting it sit for 2.5 weeks and now at the label, it’s fuller, it was initially very light, now medium creamy with caramel and those herbal notes, at one point like a spearmint mouthful. Wow, very tasty and quite enjoyable neat, hard to believe it’s 101. Mixed with ginger ale will be an amazing summer drink. Have some 2018 on the way. A great bottle will try with old fashion and Manhattan next. Glad you’re enjoying it Mark. Such an underrated pour. Thanks for commenting! Great review of a great product! Really an incredible value. I agree with your review completely!